In May 2015, CSX broke ground on a major project: reconstructing Washington, D.C.’s 110-year-old Virginia Avenue Tunnel. This project represents a major infrastructure improvement to fix a historic freight bottleneck in the congested beltway transportation system. The Virginia Avenue Tunnel project enables double-stack rail clearance through the Washington, D.C. area, providing benefits that impact the region far beyond the nation’s capital. The reconstruction project allows CSX to move goods more efficiently, reducing truck traffic, emissions and highway congestion; removing a rail bottleneck that impacts freight and passenger service; and positioning the region and the nation for additional economic growth. 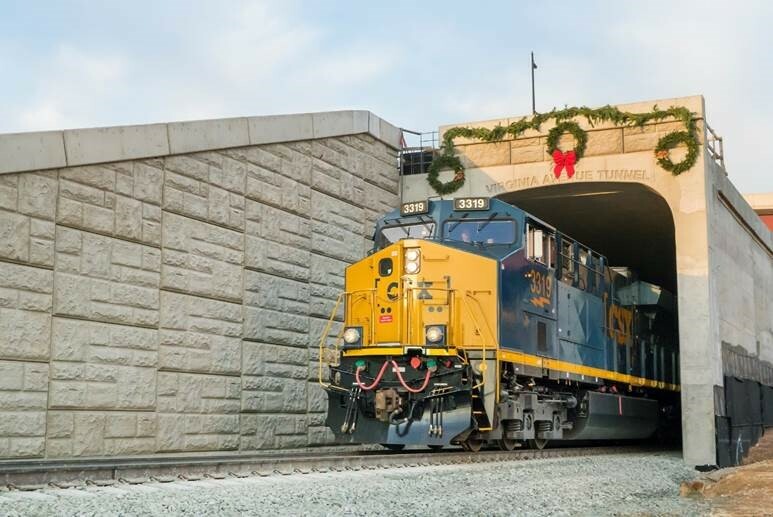 In December 2016, the first phase on construction was completed on time and the first train ran through the newly completed Virginia Avenue Tunnel. This represents the last of 61 clearance projects that comprise CSX’s $850 million National Gateway Initiative. The Capitol Riverfront Business Improvement District, which will use a grant to manufacture and install up to 10 kiosks in neighborhood to direct visitors, employees and residents to various destinations across the growing neighborhood. Van Ness Elementary School was able to purchase $20,000 worth of technology and art supplies for the students. Anacostia Riverkeeper used a grant to purchase recycling trash cans to help keep the community clean. As part of the second phase of the project, CSX is turning to additional tunnel construction and streetscape restoration that will improve the neighborhood’s lighting, create better pedestrian and bike paths and add amenities. These efforts will enhance the quality of life in the Virginia Avenue community for years to come, just as the tunnel project will add enduring capacity to the region’s transportation network.